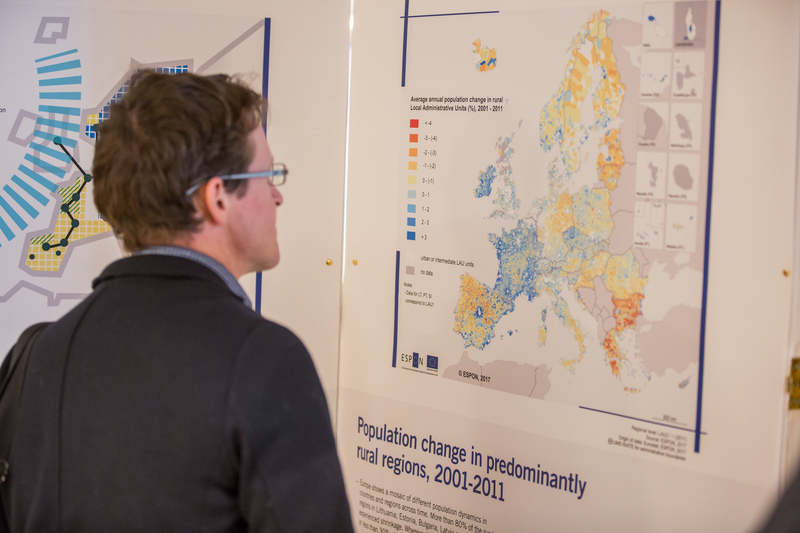 We are looking for two motivated trainees (one in the Unit Evidence and Outreach, one in the Unit Administration and Management) to join our international team for a period of 5 months. You are in the final stage of your university studies related to territorial development and planning, geography, regional economics, European studies, political science, financial management and/or other relevant fields. 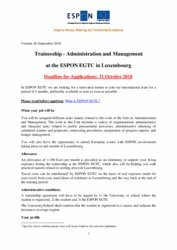 You are registered at a university during the entire period of the traineeship and carry a passport from a Member State of the European Union or from Iceland, Liechtenstein, Norway, Switzerland. Your work in the Unit on Evidence and Outreach will include a variety of tasks, among others involvement in the implementation of applied research, targeted analyses activities and tools, including the preparation of kick-off meetings with service providers and stakeholders. It will also include some financial and administrative work related to calls for tenders. In addition, you will also be involved in communication activities, and support of events, such as seminars, workshops and conferences, and producing a variety of publications and material. 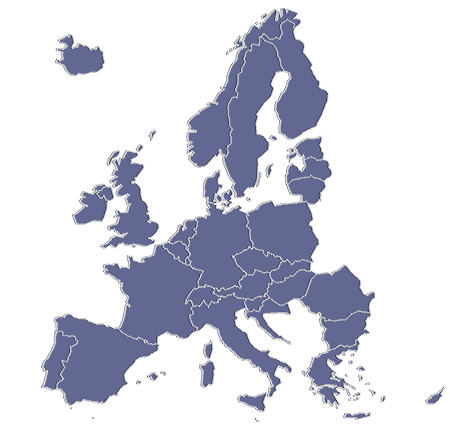 You will also have the opportunity to attend European events with ESPON involvement taking place in and outside of Luxembourg. You will be assigned different tasks mainly related to the work of the Unit on Administration and Management. The work in this Unit includes a variety of organisational, administrative and financial tasks related to public procurement processes, administrative checking of submitted tenders and proposals, contracting procedures, preparation of progress reports, and budget management. You will also have the opportunity to attend European events with ESPON involvement taking place in and outside of Luxembourg. Interested? Find more information in the vacancy and apply by 31 October 2018. 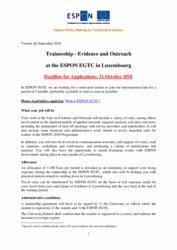 The ESPON EGTC is looking for one Project Expert/European Outreach for a period of 2 years to join our international team, preferably starting as soon as possible. Deadline for applications: 20 April 2018.